The charcoal use by communities for various purposes is found almost all parts of the world. Majority of this charcoal reached the soil ultimately and with value addition in the process of usage. Biocharculture helps is understanding these processes. During interactions with communities, experiments, field trials, discovering traditional practices in parts of India and in capacity development programs on Biochar, the scope of Biochar has expanded. BIOCHAR term is being used mainly with focus on soil / Agriculture and as well as a carbon sequestration. Biochar has a cultural value in India, like Agriculture, Vermiculture, etc, so it is convenient to explain Biochar as a new product, where as it had been "Biocharculture". The Terrapreta was originally a culture in the Amazon, without being Terrapretaculture as part of Agriculture the good practice would not have been spread covering such large areas. Biochar when it was produced it is called Charcoal (the source and temperature at which it is produced is important), once one has intention to apply as a component for amendment of soils it is Biochar. But whether Biochar reaches directly to the soil from source with direct intention / ultimately or indirectly reaches the soil after use as a secondary product it is Biochar. In parts of India as observed, the Biochar is being used knowingly / unknowingly over centuries. The Biochar use as traditional / cultural practice is there since centuries for various uses including Agriculture. Probably the soils in India remained mostly fertile due to other practices, so there was not much need to apply charcoal in large proportions. Whether the soils are fertile or infertile the Biochar presence in the soils always did only good. This aspect as experienced by farmers made them use it if available. The pottery shards from their use of pottery items also added value, in Indian fields (of more than 100 years old) pieces of pottery shards are common to find which also are part of daily life and culture. Most often the Biochar plus other components like pottery shards, bones even after many uses reaches the field / soil, especially in rural areas. The value of Biochar for application is higher when it reaches the field after its use. The multiple and ultimate use of Biochar as "BIOCHARCULTURE" makes it sustainable, adaptable by communities. Biochar is not an industrial product?! Although many terms have emerged recently to explain the Biochar commercial products by different names. Biochar was not a commercial product in the past and always had more than one value before reaching the fields for improving the soil environment and as well ultimately carbon sequestration too. 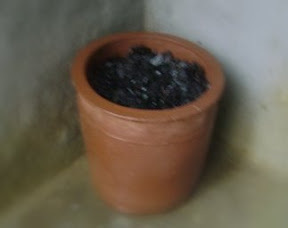 Biochar use in the old world is mostly a cultural or traditional practice. Probably Japanese are still using Bamboo charcoal in many ways. Biochar is not some thing suddenly we have innovated, we need to discover its use and also innovate new uses. All farmers can adopt and one need not be in a hurry to apply large quantities in a go to have bumper yield or crop, the annual incremental application would be more sustainable for the farmer as well for the environment. Munda tribals living in parts of Orissa, Jharkhand and West Bengal states, in India, use biochar for increasing the crop production. They mix charcoal with farm yard manure (pellets of small ruminants / cattle dung) and add to the red lateritic soils which are other wise less fertile. They cultivate vegetables and green salad in the well fenced plots of about 1 acre in size. The biochar is mostly a byproduct from the biomass cook stoves in use (most often three stone stoves / simple clay earth stoves). They have access to wood from the jungles, which is used as fuel. and a small video film. Regarding impact of Pottery shards in the soil there were several questions. I had been searching for pottery shards in the agricultural fields and most often and I got to see some pottery shards in the field. Where ever agriculture was the main livelihood, high densities of populations existence, civilization at the helm and space was a constraint, innovations were adopted by humans, and such practices are sustainable even now. The charcoal and pottery shards are the two most common by-products of human habitats. At least some charcoal / biochar along with ash was contributed by the people living in habitations in the past (see table in the above link). The availability of the quantity of such by-product, ingenious use, management and development are the aspects still to be discovered. If charcoal / pottery shards did not occur in certain areas in spite of human settlements existence, than there must be some reason yet to be discovered. But both charcoal and pottery existence as a result of human activities was beyond history, so there is no reason why these things are not seen. The fired pottery made up of clay is most popular. Still the poor people in rural villages in parts of India cook in the clay pots. The pots used for drinking water collection is most common, even today millions of pots are produced and used all over India every year, the usage would be more especially during summers. The evaporation of the water from the fine pores of the pot cool the water inside the pot. The temperature would be at least 5 deg centigrade less than the surrounding air temp. The cooling effects would be very high under less relative humidity conditions. The roofs made up of clay tiles also provide cool shelter, and very much useful in the tropics where temperatures are very high during summers. For majority of the main festivals pots or pottery items are used. From Birth to death, for all important occasions pottery items are used. http://e-smokeburnerstove.blogspot.com/ designed by me. I would like to share some of my immediate observations.